Welcome to Day 20, if you are just arriving for the first time all the details and the linkup can be found HERE. Today is a full day here on the blog as we have two sponsors and two teams joining us. Sunny Studio Stamps and Altenew each have a wonderful collections of tags to share with you. 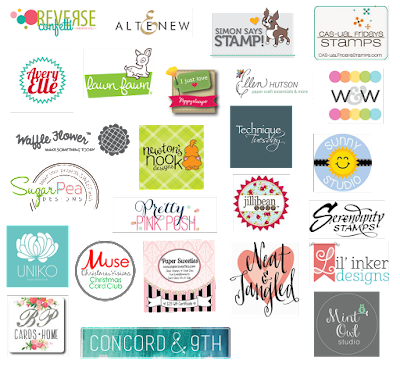 Sunny Studios is offering the Crescent & Traditional Tag Topper dies to one lucky winner! Altenew is offering a $25 gift certificate to their online store to another lucky winner! Remember there are so many ways for you to get multiple chances to win--by following the blog hop each day and commenting on the posts or by participating and making tags of your own. Wow... so many tags to choose from! I spied a wreath in the mix and haven't made one of those as yet, so that's the tag for me today. What inspired me today are all the little images that are so adorable I have to go check out their manufacturers' websites. I want to create tags that are just as cute. Tracey, I love your Altenew tag!!!! 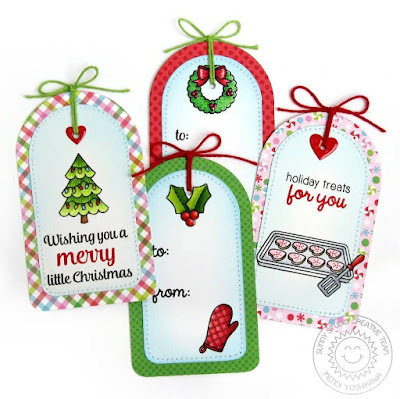 And I'm a huge Sunny Studios fan - love all those tags - I need to add some topper dies to my cart next time I shop! Oh happy day! Two chances to win today!! Both companies have such awesome stamps. I love the newsprint Christmas Tree! The flowers tag and for sure the hot cocoa tag inspire me today for sure! LOVE the colors too! What a wonderful post full of amazing inspiration, wow! I just love those purple flowers, so refreshing for Christmas. These are all gorgeous! LOVING those little deer on Emily's tags!!!!!!!!!!!!! I'm inspired many times a week by Therese Calvird ... she's made me fall in LOve with her jingle bells today!!! All gorgeous, ladies! WOW! Such beautiful and sweet tags! Love the critters and florals...sigh...they're all amazing! Gorgeous tags!! I love all of them. My favourite is Lindsey's tag with the mug :) it is so darn cute!! Oh my goodness--such inspiration today! 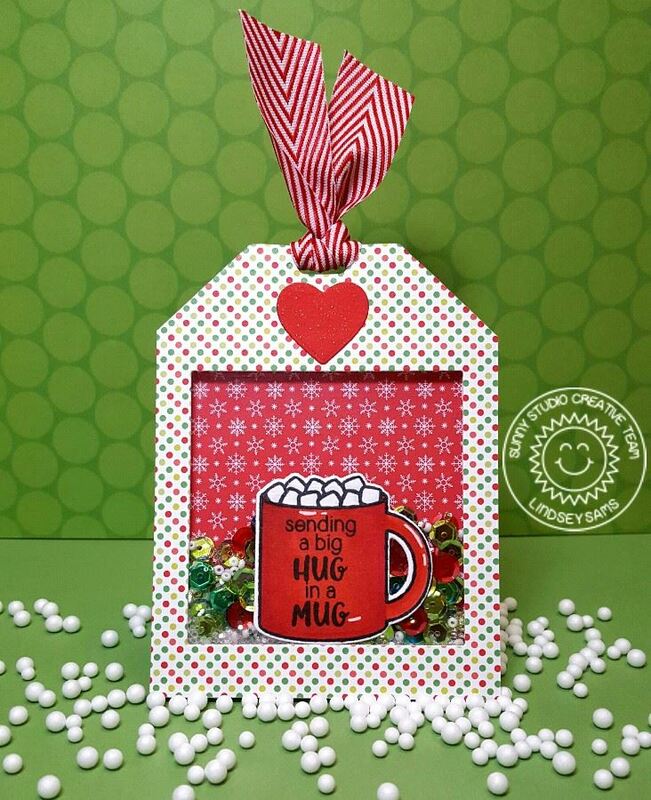 I adore Lindsey's shaker with the cup & your poinsettia tag--wow! Oh how CUTE!!! I never thought of making tags from a tree die. Not so out of the box but I LOVE it!! I love your pretty tag with the fun lights. I need to dig my light stamps out and give it a try!! Wonderful tags by everyone!! What an array of WOW here (again!). The 'treats' tags have my sweet tooth tingling and oh, how your poinsettia catches my eye, too! Lots of inspiration today! 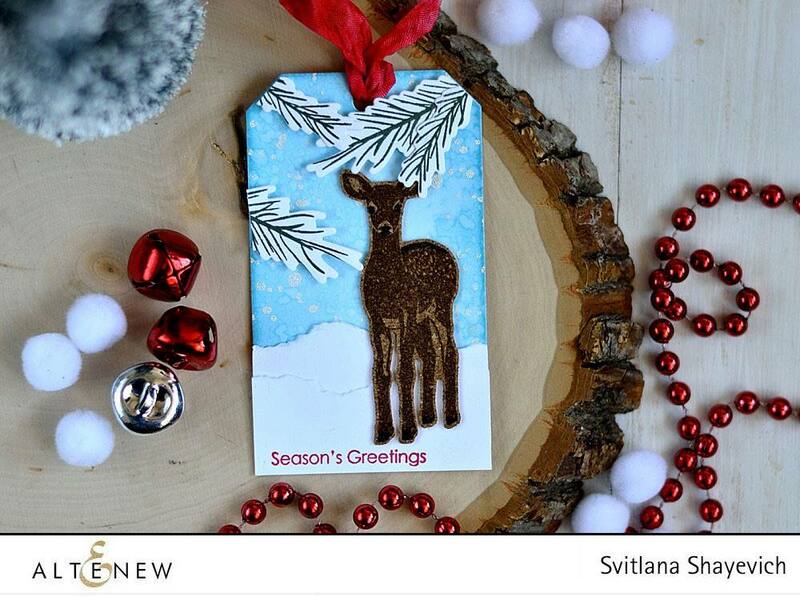 I really love Svitlana's Altenew card with the deer because I just got that set! Oh my goodness! All of these tags are inspiring!!! My favorites are the baking themed ones with the cut out shaped cookies! 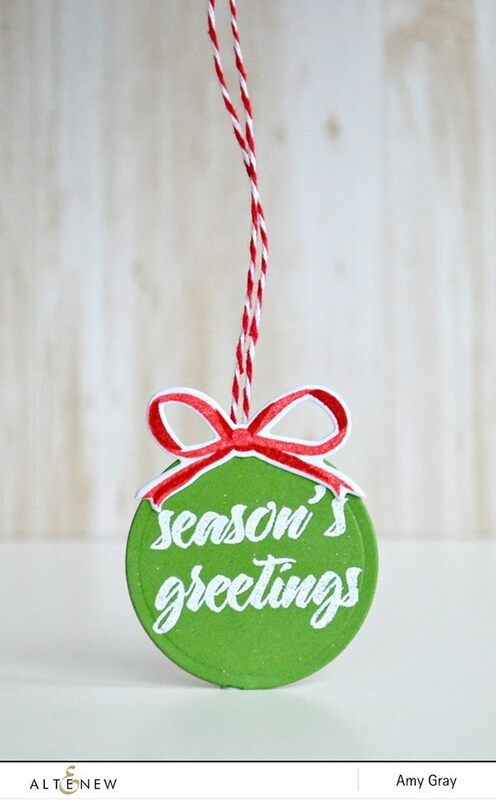 We bake cut out cookies each year at Christmas and these tags bring warm memories to mind of Christmases past! Gorgeous tags! I am inspired to make a shaker tag! there are so many tags here that I'd love to make, but things have got in the way & I've slowed down. Linked seven so far & hope to make four more at least. Fabulous mix of tags from cute to elegant. I really like the different scalloped edge tags, it's such a nice element. Love your tag with the Christmas lights! I love all the whimsical images that are so perfect for tags using the Sunny Studios Products! 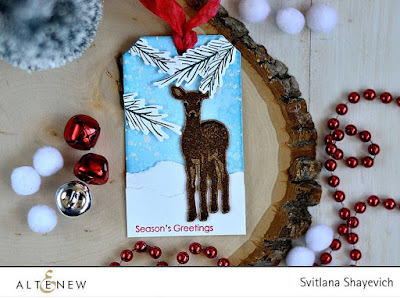 And That beautiful deer and your poinsettia tag using Alte New's supplies are so elegant and breathtaking Tracey! Beautiful work and lots of inspirations from everyone! 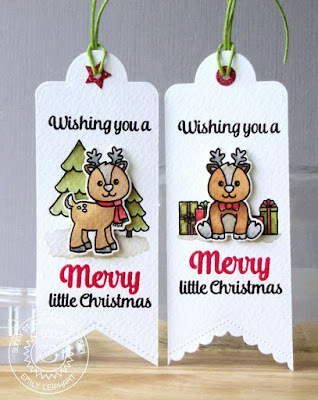 Mendi's tags are absolutely adorable and I love your Christmas lights....gorgeous coloring. I am inspired today to make a grouod of small tags like Mendi. I am loving these 25 Days posts and will be sad when they are over. Oh my! I love that sweet cup of cocoa and the holiday lights---so fun and festive!!! So much inspiration! I love the christmas lights string. Beautiful tags Tracey, love them all, todays inspiration was yours again, I must be drawn more to your style I think. Love the globes in the rainbow colours. Bright and breezy. Fantastic tags! 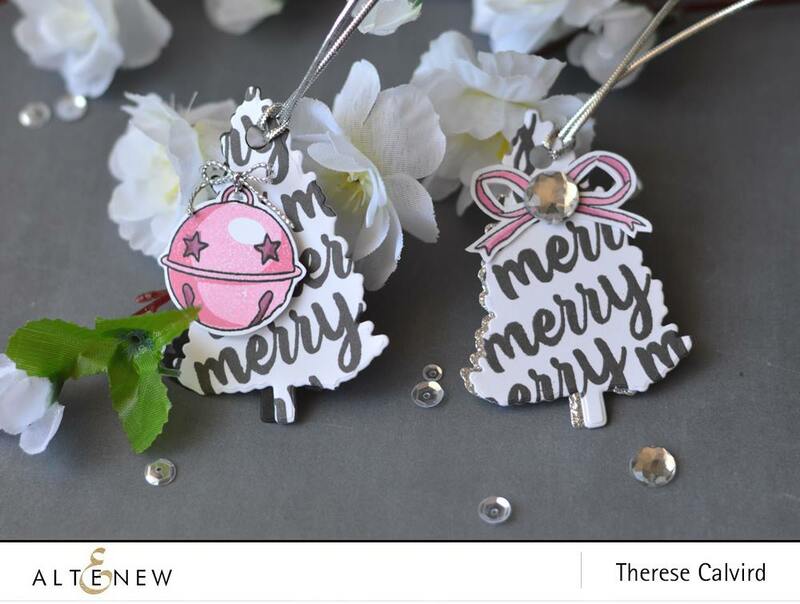 I find Therese's tree shaped tags unique and inspiring. Gorgeous tags, Tracey! 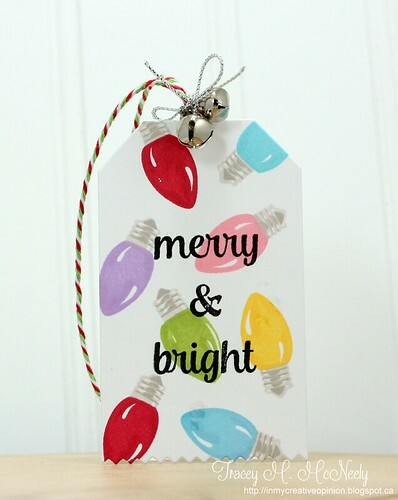 I was most inspired by your Christmas tree lights...such a fun and colorful tag! Beautiful tags by everyone today, especially those charming trees by Therese (which also comes with a video)! Wow more beautiful tags. I love the holiday lights. I just bought the stamp! Oh wow, what a line-up today!! The bulbs on your tag look so real Tracey and don't you just love that Altenew poinsettia!! WOW! Awesome tags!!!!!! Love them all! Wow...so much incredible inspiration! Love those sweet little baking tags. another day of wonderful inspiration - especially love yours and Aga's. There is SO much inspiration here, Tracey. I love your light tag and Therese's trees. 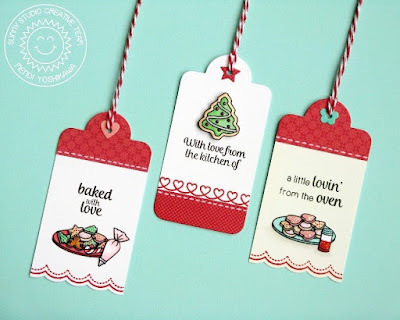 I just love the fun baking tags! So much talent and amazing inspiration today. Love both Sunny Studio and Altenew. 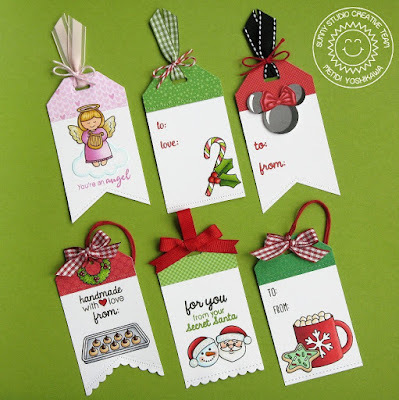 I will say I was especially inspired by your poinsettia tag, Tracey, just entered one similar to it in your challenge! Today I get a lot of inspiration from Eloise Blue and also from your tag. I just love the bulbs on your tag, they remind me of my childhood and our tree and from Eloise, because I just love the idea of putting a tag like that on a home backed gift. Thanks for sharing these all with us. Very cute. I like the ones with a baking theme and your beautiful poinsettia tag. So many gorgeous tags! I have to admit I'm drawn to those adorable reindeer and the fun style on both of those tag sets. It's inspired me to make some critter tags. Tracey, I'm super inspired by your Christmas lights tag! It's so beautiful! Tracey, so inspired by your Christmas lights tag! Oohhh they are all amazing, love them all hard to pick a favorite but I think I like Mendi's serie and the last tag by you, Tracey. Thanks so much Tracey, all the inspiration is so wonderful, what a blast! 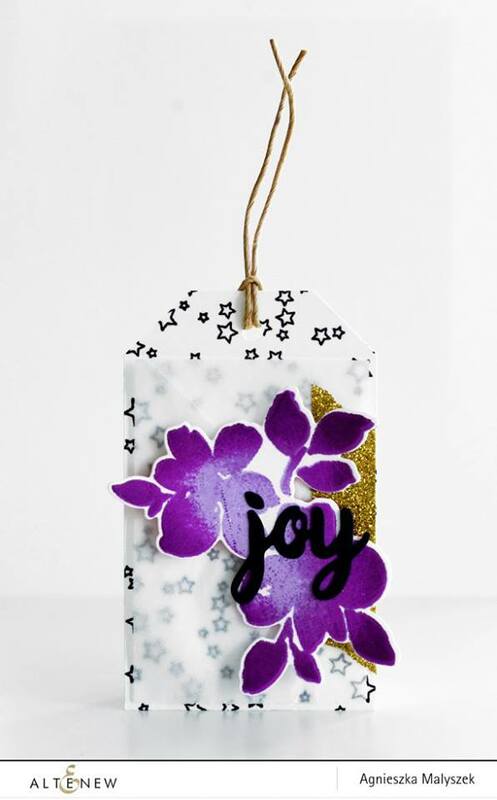 Bright and cheerful tags! 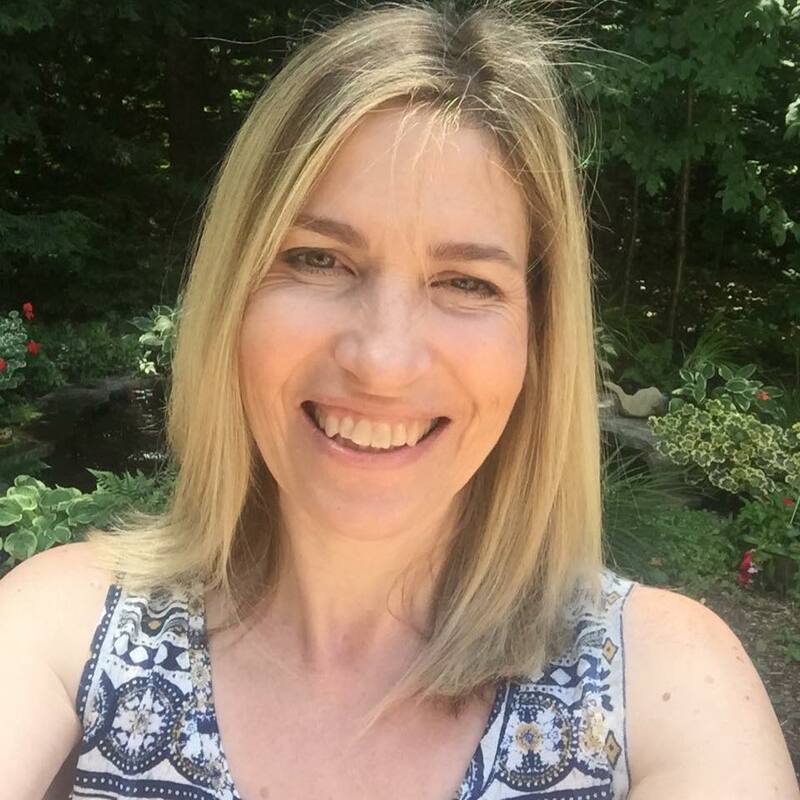 Today I am most inspired by Therese Calvird! I love her pretty color combination with the black and pink! It's so festive! These tags are amazing - I love them all! Every day they are fabulous and different! Thanks so much for sharing so many! Another day of fabulous tags! Love the shaker tag! I will have to give it a try, my grandkids would love them! 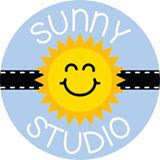 I've never heard of Sunny Studios before! What sweet images they make. I'm inspired by the different shaped tags they are showing with the rounded tops, scalloped bottoms and even banner cut bottoms. I never think to vary my tag shapes! So So adorable! When I want a "cute" look, I reach for Sunny Studio. But Altenew is just as great with their gorgeous flowers and "artsy" stamps. There's so much inspiration to choose from today. You used one of my favorite poinsettias - Altenew's - for your lovely tag! Wow! These tags are awesome! Love the unique shapes and beautiful designs! Love Mendi and Eloise's treat tags. I make a lot of food/treats for other people at Christmas so I love these ideas. TFS! Oh I'm digging that Sunny Studios mug full of marshmallows shaker and the Altenew Galactic black tag!! Love these ideas. I had forgotten all about the light bulb stamp I have. Going to pull it out and put it to use. Thanks for the idea. Oh my, so many wonderful tags. I especially like Mendi's first set of tags, but I also love your poinsettia tag. All fabulous! 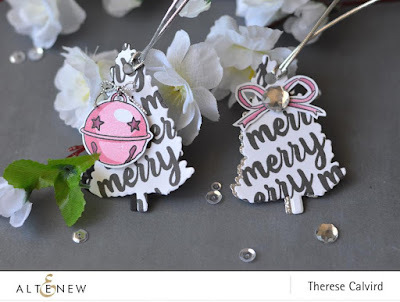 I especially love Therese christmas trees with the text! More pretty tags! Love them all Tracey and ladies. 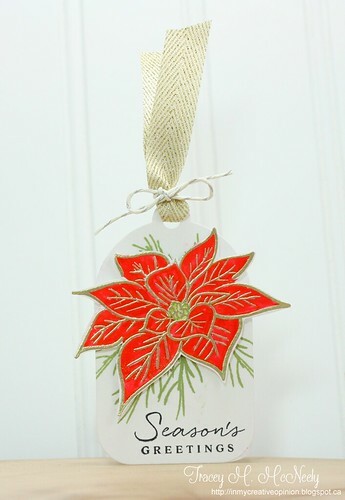 Tracey, seeing your poinsettia tag inspired me to take out my poinsettia set... and I finally made a tag! It was so much fun! Need to make more! Thanks for the inspiration! Love that today shows sweet and elegant! 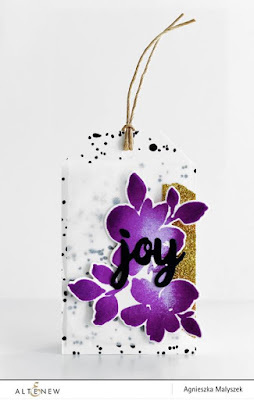 So pretty love the flowers especially the purple a nice change from the typical Christmas tag. Love the baking theme tags - cute designs and the reindeer are adorable! The purple flowers from Agnieszka really caught my eye. fun whimsy images today! Love that red sky! Awww!!! Great sponsor today!!! What I loved most is the sweetness and the funny of Sunny Studio Stamps Team's tags and the elegance of Altenew team's tags. Wow! Great inspiration today! 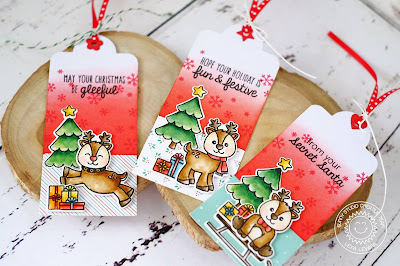 I loved the tags with all the sweet things from the kitchen, but I am missing those kind of stamps, so I went with the cute little reindeer. Oh, so many amazing and cool tags. Sweet and elegant. Love all the baking images. 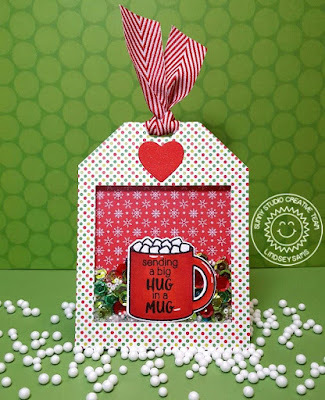 Perfect for a gift of goodies! 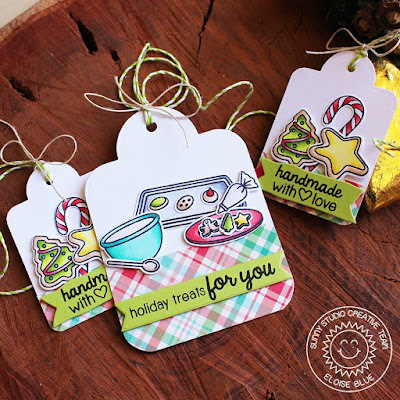 I often give homemade treats as gifts so all these tags for handmade treats are a great idea. I am liking the neat cuts on the banner tags. I also liking the tag from Sveta. Fabulous tags! Love Sveta's bold black one! Gorgeous! Love that vibrant poinsettia! I love those sweet little tags that Mendi made! What fun it would be to receive some home baked goodies with one of these tags attached! From Mendi's super cute tags to Aga's gorgeous purple bloom, I am LOVING this post! Oh... this Sunny Studio bells/ornaments/bulbs are just amazing!! Wow! Sp many tags! And all so wonderful! 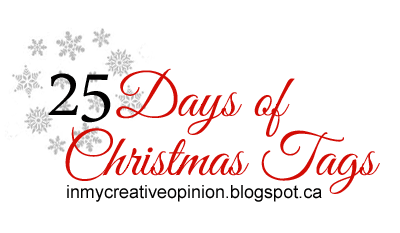 I'm inspired by both tags from you - the lights one and the poinsettia! I've always wanted to try using lights on my Christmas cards/tags. I have a thing for poinsettia!